This flyer contains general information on Bluebirds – how to attract them and the best ways of helping them. There are also sample letters that can be distributed with the flyer. These publications were prepared by a group of members of the Nature.net Bluebirding Forum. 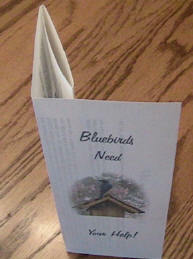 We hope they will be distributed in person, or by mail, to increase Bluebird awareness in our neighborhoods. The authors and preparers of the flyer wished to make it freely available to anyone with an interest in Bluebirds. To this end, it has been converted into a pdf file, which is the most universally available file format, requiring only the free Adobe Acrobat Reader. The file may be downloaded at the link below. This flyer may be printed using any color inkjet printer, or it can be taken to a printing facility that is equipped to print pdf files. While the flyer is free to download, print, and distribute as you see fit, the authors retain control of its content. The flyer may not be altered or amended without the authors’ consent. BluebirdNut.com and the flyer’s authors encourage persons distributing this flyer to do so in a responsible manner, in accordance with any local requirements (e.g., it should not be placed in a mailbox without going through the postal system), and take no responsibility for the failure of any distributor to do so. To download the file, right click on the Bluebird Flyer link then save the pdf file to your hard drive. If you have any trouble opening or viewing the file, try updating your Adobe Acrobat Reader to the most recent version. You can find this free download here: Get Adobe Reader. If you have a two-sided printing feature on your computer’s printer, follow your printer’s instructions for re-insertion of the paper to print the second side of the flyer. If your computer’s printer does not have two-sided printing enabled, print page one of the document first. Then insert the paper into the printer so that the reverse side is the same way up as the front side. The authors have also included two letters that may be distributed along with the flyer. These letters may be useful for those in a position to offer a higher level of support to their neighbors. Letter No 1 – Offers your services in purchasing, setting up, and monitoring nestboxes on your neighbors’ property. Letter No. 2 – Offers to help the neighbors get started by providing advice on choosing a nestbox, mounting solutions and locations, and answering questions during the nesting season. If you would like to host a copy of this flyer on your own website, please e-mail us with your request. What is a Birding Calling Card? A birding calling card is an excellent tool for promoting wildlife conservation and avian habitat preservation in those communities you visit for birdwatching. By leaving a calling card whenever you patronize businesses in these communities, you will telling them that the reason you are there, supporting their economy, is because it is home to the birds that you love. We have created a free, downloadable Birding Calling Card in Adobe pdf format, which can be opened and printed with the free Adobe Acrobat reader. This pdf file can be used to print the calling card on perforated business card stock, which can be found readily in most office supply stores, or it can be printed on plain cardstock and trimmed to size manually. Right click on the thumbnail at left, and select “Save target as” to download this file. We’ve also made available a free downloadable business card helping to advertise Bluebird Nut’s own Bluebird Discussion Forum, the Bluebird Nut Cafe. As with the Birding Calling Card, you can download this card by right-clicking on the thumbnail, and selecting “Save target as” or “Save Link As” and saving it to your hard drive. The card can be opened and printed using the free Adobe Acrobat reader. You can use either perforated business card stock, or plain cardstock which you can trim manually to business card size. Use this card to tell friends and neighbors about this free discussion forum “Where Bluebird enthusiasts gather to discuss all things Bluebird”. 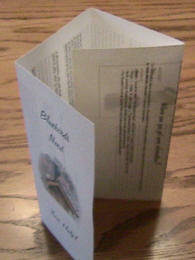 Leave some at your local wild bird supply center, or pass them out at your Bluebird educational presentations. Help bring more new members to the forum, and make it an even better place to gather! In addition to the free printables on this page, we have designed a line of Birding Stickers and Buttons which we have added to a brand new Conservation Promotion section of The Bluebird Gift Shop. Use these items wherever you visit for bird-watching to promote avian habitat preservation programs. They can be displayed more universally and get your message across to more people than a calling card alone.